Chocolate is a versatile food. You can eat it as a confection, as a dip for fruits, as a dessert topping or as an addition to hot beverages. Further, dark chocolate does have some health benefits, due mainly to the antioxidants it contains. Indulging your craving for chocolate is fine, as long as you do so only occasionally. Eating large quantities of chocolate can do more harm than good. Chocolate is high calories, and excess caloric intake leads to weight gain. Being overweight can result in a number of health problems, including heart disease, diabetes and high blood pressure. Hershey’s standard 43 g milk chocolate bar contains 210 calories, 13 g of fat and 24 g of sugar. But if you eat only one or two small pieces of the chocolate bar, rather than the entire thing, you should be able to control your weight while fulfilling your chocolate craving. Chocolate is high in sugar. Without sugar it would taste too bitter for most people to eat. High amounts of sugar in your diet can lead to dental problems like gum disease and cavities. Another concern of eating large amounts of sugar each day is the increased risk for diabetics. If you are a diabetic, chocolate can cause your blood sugar to become elevated by supplying you with more than a meal's worth of sugar. Chocolate contains caffeine and is also very acidic. Caffeine is a bowel stimulant, which can worsen symptoms of irritable bowel disease or diarrhea. Acidic foods, on the other hand, can cause an increase in stomach acid, which can result in heartburn, acid reflux or inflammation of an existing stomach ulcer. If you struggle with gastroesophageal reflux disease or peptic ulcer disease, you might find that chocolate tastes good going down, but brings regret once it hits your stomach. Chocolate is high in potassium. For most people, this is not a problem. But those with adrenal disease or kidney disease need to watch their intake of high-potassium foods to avoid elevated levels of the mineral in their blood. A 2 oz. 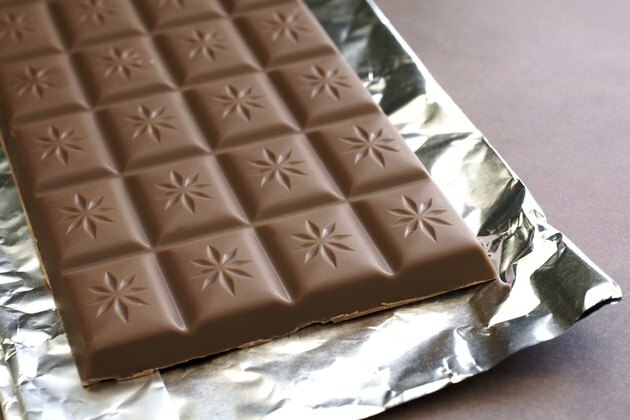 piece of chocolate contains more then 200 mg of potassium. Therefore, if you have a condition that requires you to restrict the potassium in your diet, chocolate is not the treat for you.